inside a winter inside a winter inside a long night. The repetition sets up ritual, as in a spell that binds a woman to the story she did not want. Repeated lines and images increase that sense. “Of all the things I was I was cold” is followed later by “Of all the things I was I was not.” And later: “We had to make calls to ask strangers to remove the obstacles” is followed by “We had to ask strangers to remove the obstacles.” The repetition would be a comfort, but the images and the variation are restless, the obstacles open to interpretation. The repetition of white—not often associated with October or with pumpkins—and the alliteration and assonance, the “l” sounds of pearly and plume, lend this bleached season an underlying lushness, while “Thin as a plume” reminds us that the year is dying. Just as any good magic requires the right ingredients, Sweeney charges her words’ potency by fusing them. In Hopkins, we find crush-silk, May-mess, rash-fresh, blue-bleak. Sweeney gives us grooveworks, fieldrush, neverlasting, god-quiet, clocksong, littlebluefish, and littlebigheart. The language creates its own phenomena that reject ordinary expectations of the witch, the spell, the nest and egg. Beyond the images and their sounds, beyond the narrative and grief’s recurrences, the book’s silences startle. They invite the reader to listen. Rather than relying on pyrotechnical snazzy dazzle, the poems offer a fierceness that, to paraphrase Dickinson, stuns you by degrees. Whether a known territory—a shared experience—or an unfamiliar realm, these poems lead the reader, almost as though strolling across a meadow where we find “the last cinders of dusk falling into place.” Suddenly night drops, the moon appears, and you see everything you’ve just passed differently, above and under the surfaces. 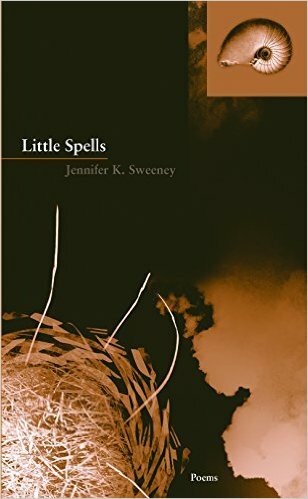 Little Spells resonates with presence and emotional space—an amplitude that lets you breathe through each separate story, each anticipation and anguish, with the hard-won trust that the world will see spring again. Joannie Stangeland is the author of In Both Hands and Into the Rumored Spring, both published by Ravenna Press, two chapbooks, and the pamphlet A Piece of Work. Her poems have also appeared in Front Porch Journal, Off the Coast, Hubbub, Santa Fe Literary Review, and other journals and anthologies.